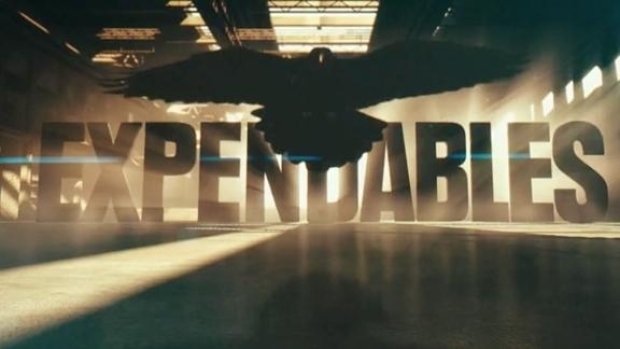 "The Expendables," about a team of mercenaries out to overthrow a Latin American puppet dictatorship, almost perfectly recaptures the look and feel of the '80s era action films that made its director/co-writer/star Sylvester Stallone famous. For some this will be 103 minutes of cinematic heaven, for others a grueling slog through an ocean of cartoon violence and macho posing. The opening title sequence of "The Expendables" shows a number of motorcycles winding through otherwise empty streets, a procession that ends with the bikes wheeling into a garage. We then see a close-up on the gas tank of one of the bikes emblazoned with the Expendables skull logo. The shot then dissolves into a view of the Man on the Moon. It's an unintentionally hilarious moment that sets the tone for the rest of the film. "The Expendables" is loaded with more chemically and surgically modified bodies and unintelligible diction than most pornos. Deciphering the conversations between Stallone and Lundgren was tough enough when they squared off in "Rocky IV." Twenty-five years and countless blows to each of their heads later, it is all but impossible. Subtitles would not have been out of order. Not that an improved level of clarity would've necessarily been an improvement. Pretty much everybody in the film seems determined to snap off the most one-liners, with one pithy line after another hitting the ground with a lifeless thud. And then there are the characters' names. Stallone's Barney Ross is the only "normal" name in the bunch, the rest of the gang bearing names like the too-clever-by-half Hale Caesar; the only mildly racist Ying Yang; the it's-not-Gunnar it's Gunner Jensen; the obvious Paine; Tool; the dopey Toll Road; Trench... The parade of absurd names is so great that one could be excused for suspecting that the names of the couple played by Jason Statham and Charisma Carpenter, Lee and Lacy, are an homage to the former 16-year veteran of Major League Baseball. And perhaps most puzzling is Eric Roberts' James Munroe -- it would appear that possibly this was some nod to our fifth president's famous Monroe Doctrine, but only Stallone knows for sure. There's no shortage of action, but none if it truly stands out as inventive, awesome or insane -- it's just a lot of stuff blowing up. And the violence is largely run-of-the-mill as well. There are moments when bodies are ripped apart in a fashion that would elicit laughter in a zombie movie, but "The Expendables" takes itself so seriously that these moments comes off as ridiculous. 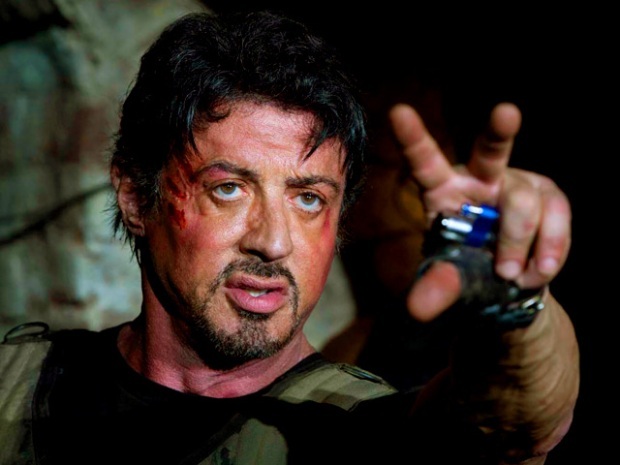 Stallone is to be given credit for recognizing his own limitations as an action star at the age of 63, scripting himself as the loser in a nasty fight and making himself just the team's leader, "brains" and heart, but not its most imposing muscle. He leaves the heavy lifting for his younger, more spry successors. The acting is about what you'd expect, though two performances stand out, those given by Mickey Rourke and Eric Roberts. Rourke as Tool, a former Expendable and now the group's go-to tattoo artist, seems at times to be trying desperately to remember his lines. But there's one scene where he recounts the mission that made hum give up the life of a mercenary, one that he plays as if there were an Oscar on the line -- his reading is so earnest and sincere it feels totally inappropriate and out of place amidst all the testosterone. Roberts, for his part, just gnaws his way through every scene, relishing yet another chance to play an unrepentant sociopath -- his fun is our fun. Barney Ross: What's wrong with this picture?